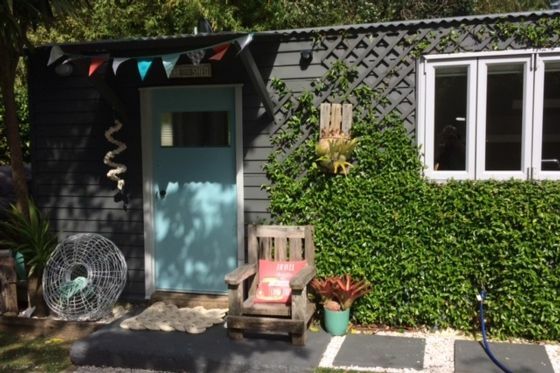 Mt Paku is one of Tairua's most stunning senic locations, with breathtaking summit views, walks and birdlife what more could you ask for, relax away from the hustle and bustle of the town centre. Enjoy the surroundings while you unwind with your favourite glass of wine, while the kids play in the outside bath (bubble bath supplied) and Dad works the the BBQ for dinner…life couldn't be better. The decked area is perfect for entertaining, sunbathing or if you like when the suns gone down and the fairy lights are on take a relaxing bath and listen for our local Ruru (Morepork) while doing some star gazing. The outdoor shower is a must after a long day at the beach. Children's toys available for wet days entertaining also a large trampoline for some sunny outdoor fun. The Little Shed is perfect for a couple or a small family's getaway. Light cleaning is appreciated and cleaning supplies suppled (leave as you found it). Return key to where you found it when you checked out. Bring your walking shoes the Playground is only 5mins, Marina andamp; Beaches 10min, Town 40mins walk. "The Shed" is a delightful little place. The warm welcoming hosts Donna and Matt have thought of everything you could possibly need , from beautiful scented candles through to sturdy spades if you want to visit Hot Water Beach, and not to mention the chocolate and wine waiting for you on arrival. The bed was extremely comfortable with an abundance of cosy throws if needed. The outdoor area is gorgeous and we made use of the outdoor bathtub, which has fairy lights above , and candles. The property was spotless and a lot of thought has gone into the lovely welcoming decor . We will definitely be back. Thankyou . Donna and Matt's eye for detail and the welcoming feeling we experienced made our stay relaxed and feel refreshed. There is everything you need in the Little Shed; just bring food and togs and you've packed! A perfect retreat, very relaxing in a great position. Wonderful hosts, clean accommodation and a great location. It is a small space inside the 'shed' but it's enough for 2. There's even a space outside where there's a bbq. Thank you Matt and Donna! Cute little bach in Tairua. Decorated wonderfully. Amazing and large outside deck area and BBQ area. Just enough indoor space for 2 people comfortably. Hosts were lovely and accommodating. I stayed with my 3 kids for a long weekend. We just loved the little shed which was warm cozy and well thought out with lots of personal design touches that gave it a great look and feel. The bed was so comfy and linen well-designed and luxurious. Loved all the little details and thought that has been put into the shed and garden area - down to the fact that you can turn off the outdoor bath tub tap with your big toe so you don’t even have to sit up! A lovely place for a weekend getaway to relax and chill and perfect location with sea views and short walk up to the summit. Donna and Matt were great hosts - welcomed us with a warm spotlessly clean shed, eggs from their chooks, wine and chocolate - they appeared unperturbed by my noisy and excited children! We will be back.